As I said in my Bane rant, it seems like a lot of people wanted to peg The Dark Knight Rises as an awful film as soon as any information about it began to trickle out. Take Catwoman for example. People were already inexplicably up in arms when it was announced that Anne Hathaway was cast, but the furor only intensified when the first set picture was released and MY GOD SHE DIDN'T HAVE EARS. Well, regardless of the fact that in the somewhat more down-to-earth "Nolanverse" it might make sense for a vigilante to use bat ears as a familiar symbol to make criminals know him and fear him, but the same ears might not be so wise for a master thief to sport when she wishes to avoid being identified, the fact remains that all this outrage was based on a single photograph. Anyone who took a few deep breaths was soon rewarded with follow-up photos that showed her goggles, when raised to the "up" position, clearly resembled cat ears. The fact that she's got goggles in the first place, when added to that with the facts that she's rocking a black skintight cat suit and a domino mask, all seem to make for a pretty solid Catwoman. But haters gonna hate. Mattel has released a Catwoman figure as part of its Movie Masters series, though there's a bit of confusion as to which series she's a part of. The back of her package doesn't show Officer John Blake or the "mystery" sixth figure, but she's not shipping with the initial waves of Batman, Bane, or Alfred. For the record, mine came from Amazon (itself, not a third party vendor) when it was very briefly available for retail plus shipping. 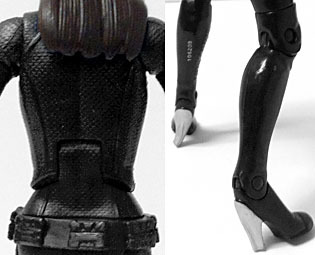 Catwoman's sculpt mainly showcases her textured cat suit, with a smoother surface on her thigh-high boots and elbow length gloves. Her proportions are pretty good, considering this is a Mattel figure and their work on DCUC has been spotty in that regard. She has a bit of a "diaper-crotch" in the front, but at least her waist isn't wider than her hips. Her hands, however, seem awkwardly tiny. Details include some piping on her torso, a silver zipper at the neck, a black utility belt, and some wicked silver high heels. This was another point of fury for the nerd-ragers: that high heels were somehow stupid for a cat burglar. Well, of course they are, but this is hardly the first Catwoman design to feature such absurdity. Above the neck, we get a pretty decent, if austere, portrait of Anne Hathaway. Her expression is beyond flat, especially with her lifeless, doll-like eyes, but there's no denying that is does at least resemble the actress it's meant to. 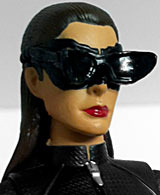 Her brown hair is slicked back and falls just past her shoulders, and her domino mask is peppered with different textures, and even a couple of different colors: while it's mostly black, there are also silver and copper accents. 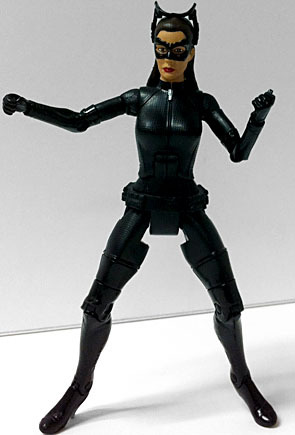 Catwoman has some pretty snazzy articulation: balljointed head (slightly restricted by the hair), peg and hinge shoulders, peg biceps, hinged elbows, peg wrists, hinged torso, peg waist, Mattel-style peg and hinge hips, peg thighs, hinged knees, and hinged ankles. All the joints are tight but freely moving, and it's definitely worth noting that, in general, these DKR Movie Masters feature some of the most solid quality Mattel has put forth in a very long time. Anne doesn't get any accessories to call her own, unless you count her goggles, which you shouldn't, because they don't come off. She does get a piece of the Connect-A-Thingy Bat Signal though: it's a piece of rooftop that the foundation of the signal assembly plugs into. 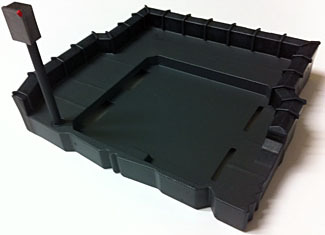 It's a pretty large and detailed piece, and even includes a control box attached to a pole that plugs into the rooftop. Catwoman's not a great figure, but she is a solid one, in terms of both construction and representation. She gets the job done, features a nice likeness and a detailed texture on her outfit, and for a figure with such a small footprint she was able to hold a nice variety of poses without toppling over. And though she doesn't have a skintight hood with cat ears, she's still very obviously Catwoman, and probably the most realistic version yet (well, minus the heels).